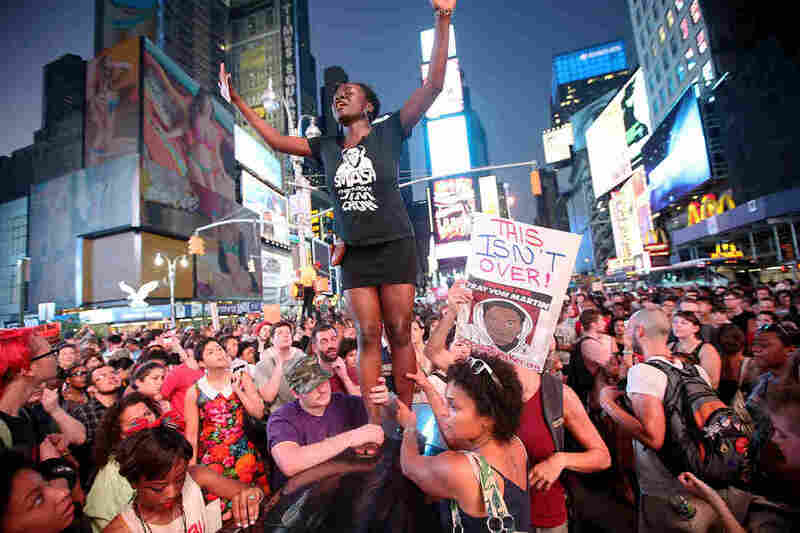 Zimmerman Trial: 6 Headlines That Tell The Story : The Two-Way As the not-guilty verdict set in, protesters took to the streets and thinkers asked the big questions. Trayvon Martin supporters rally in New York's Times Square on Sunday. A little more than a day after a jury handed down a not-guilty verdict for George Zimmerman, thousands of people gathered in cities across the country to express their anger and dismay. As The Associated Press reports, protesters in Chicago, New York City, San Francisco and Los Angeles expressed their support for shooting victim Trayvon Martin, and said the verdict was a "miscarriage of justice." Most demonstrations were peaceful, though the wire service reports that one protest in Los Angeles was "dispersed with beanbag rounds." -- Federal Charges? NPR's Carrie Johnson tells Morning Edition that the Justice Department has a "minimal role" in this case. It would pursue a case against Zimmerman only if it's clear that a federal law was broken. In other words, Carrie says, officials will act only if they are confident they can prove beyond a reasonable doubt that Zimmerman acted with racial animus and with "willful and specific intent" when he shot and killed the unarmed 17-year-old. "That's much harder to prove than the manslaughter charge" Zimmerman was acquitted of on Saturday, Carrie said. That said, the Justice Department has said it is still looking at the evidence in the case. -- Why? The Miami Herald's Leonard Pitts Jr. argues that there is still a huge, overriding moral question left unanswered in this case: Why? "For many of us as African-Americans, that night was a recurring nightmare driven to a horrific conclusion. It was the driving-while-black traffic stops, the 'born suspect' joke that isn't, the cost of being black in a nation that considers black the natural color of criminality." -- Trials Will Never Settle Big Societal Questions: Over at The Atlantic, Andrew Cohen dissects the law. A trial, he argues, is based on a narrow set of facts, and they are not designed to answer the kinds of questions Pitts is talking about. "Purely as a matter of law, you could say, it makes perfect sense. Florida's material, admissible, relevant proof against Zimmerman was not strong enough to overcome the burden of proof beyond a reasonable doubt. The eye-witnesses (and ear-witnesses) did not present a uniformly compelling case against the defendant. The police witnesses, normally chalk for prosecutors, did not help as much as they typically do. Nor was there compelling physical evidence establishing that Zimmerman had murderous intent and was not acting in self-defense. "The case was 'not about standing your ground; it was about staying in your car,' the prosecutor cogently said during closing argument. But in the end, under state law favorable to men like the defendant — that is, favorable to zealots willing to take the law into their own hands — Zimmerman's series of deplorable choices that night did not amount to murderous intent or even the much more timid manslaughter. The defense here wisely understood that and was able consistently, methodically, to remind jurors that prosecutors had not adequately explained (or proved) how exactly the altercation started and how precisely it progressed." "The most damning element here is not that George Zimmerman was found not guilty: it's the bitter knowledge that Trayvon Martin was found guilty." -- A Basic Human Right: BuzzFeed catches up with some Zimmerman supporters who feel vindicated by the verdict. During the trial, they were the ones holding signs that read: "It doesn't matter what this sign says you'll call it racism anyway!" and "Self defense is a basic human right!" -- Zimmerman's Gun: The not-guilty verdict means Zimmerman can request his gun back. His attorney, Mark O'Mara, told ABC news that Zimmerman needs the weapon "even more" than before.